This is a most welcome development Mark!! I'll follow the 3d printing thread with interest and contribute where I'm able to. Thanks for taking this on! 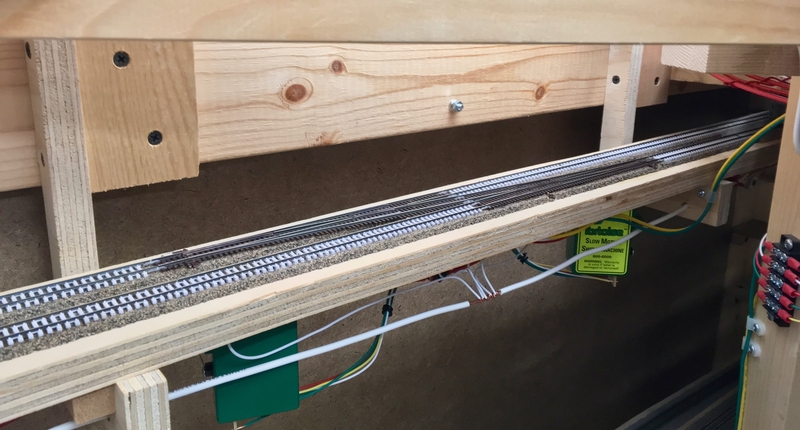 On the single-head signal, I terminated the magnet wires on Wutter's board and added a pigtail to connect to the control circuitry. I decided to go with phone cable because it's super simple and readily available, and the jack let's me unplug it for repair or maintenance. Electrically, it works beautifully. The only downside is that the cable is a little stiffer than I would like, so I'll need to add some strain relief so it doesn't pop the signal base out of its little holder. 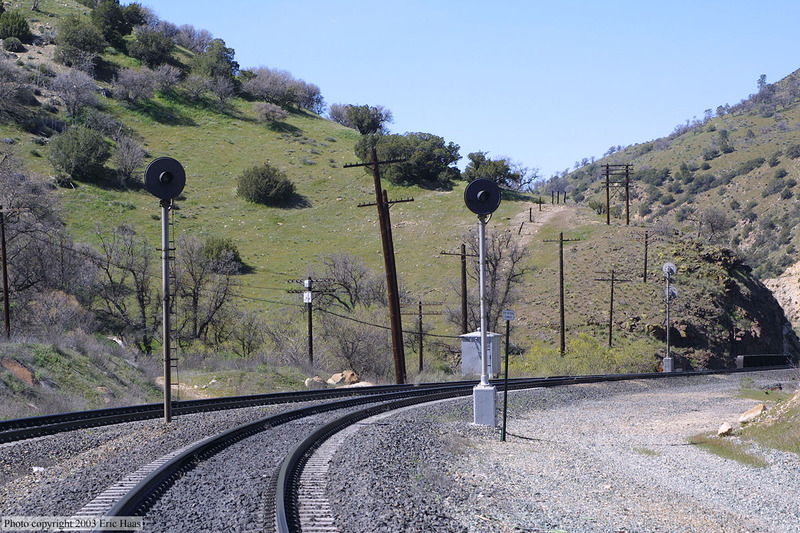 I haven't quite sorted out how to mechanically mount these signals, but I'm picturing some kind of short tube that is rigidly mounted to the base which could secure the cable and insert into the scenery. Suggestions welcome. you are right, the flat phone-type cords are quite stiff. I have never been able to find a very flexible one. This is mainly due to the thick outside jacket. 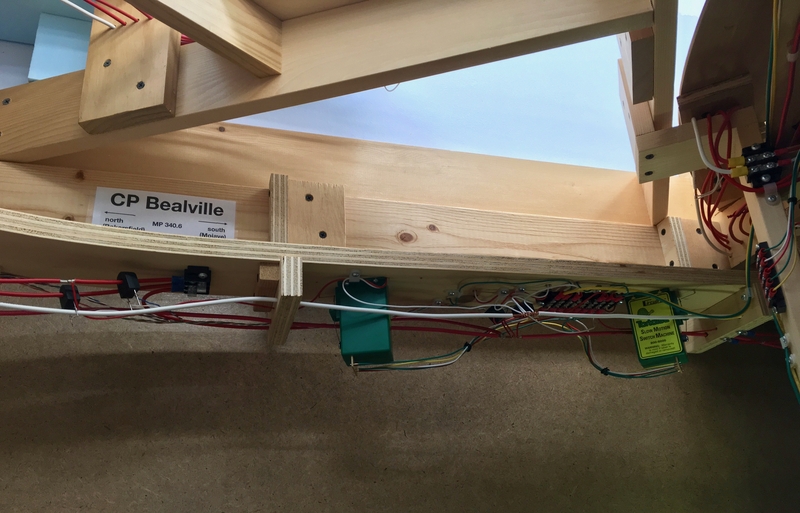 If you like the modular RJ type connections you can easily create your own very flexible version of what you have shown above. 1. Find and buy some flexible stranded wires with similar gauge and insulation thickness as the wires inside of the photo cord. 2. Take a scrap piece of the phone cord and cut it into ~ 1cm pieces and pullout the wires from it leaving just the outer sheath. 3. 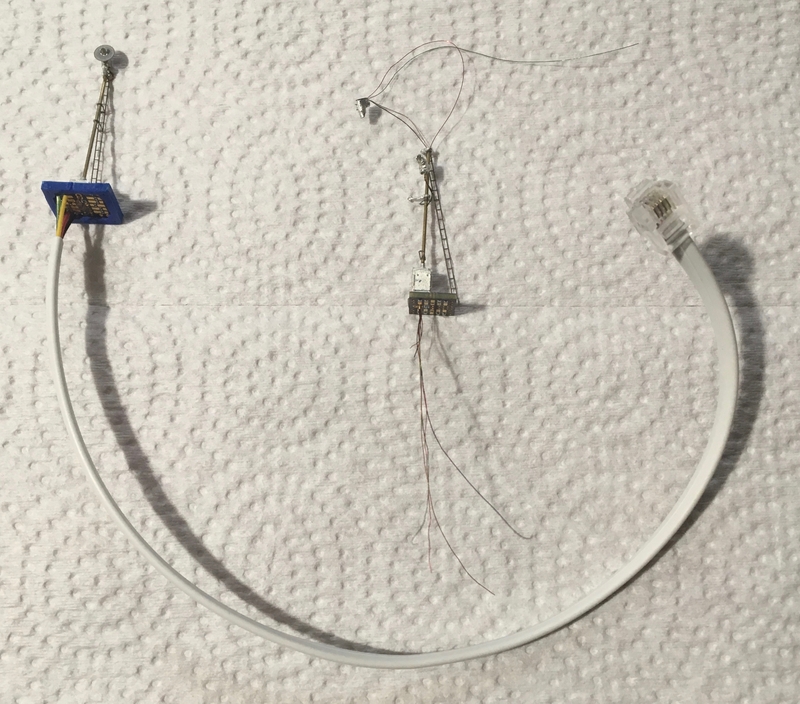 Thread four of your flexible wires through that 1cm hollow sheath. 4. Insert the 1cm sheath with the flexible wires into a modular jack and crimp it. Now you have a modular plug with pigtails (where the 1cm sheath is acting as strain relief). 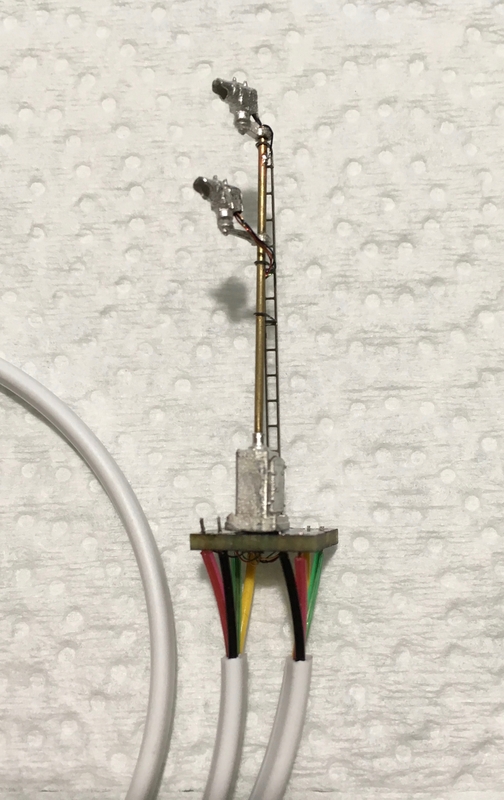 Now you can solder the other end of your pigtail wires to the base of the signal. 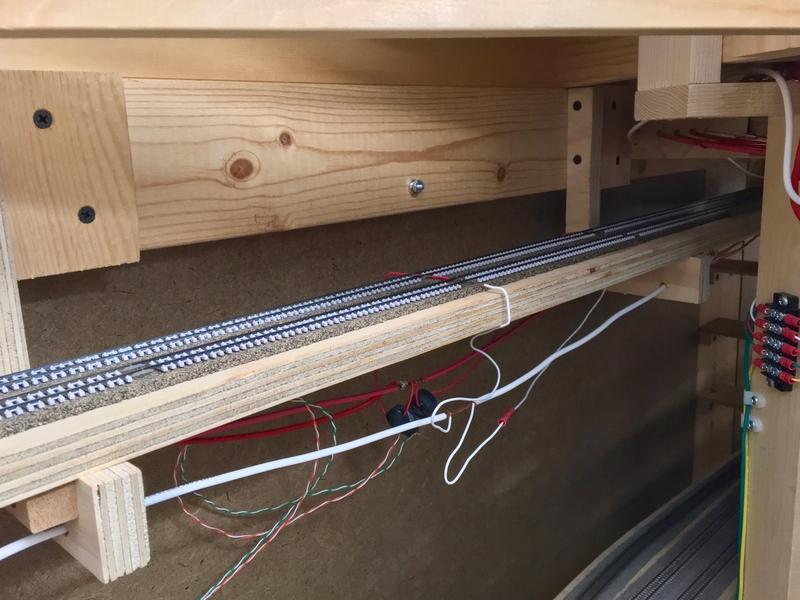 The wires are separate but for such a sort length that should not be a problem. I guess if you want you can twist them into a bundle. And the assembly is very flexible. Yes, it is a bit more work than just using the modular phone cord, but it will be much easier to deal with. I usually thread all magnet wire at once. It’s almost impossible to feed additional wires later. 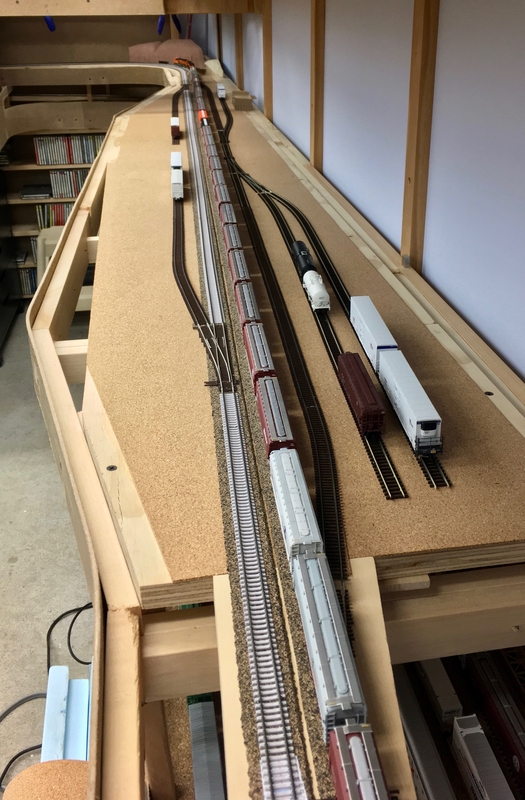 I feed them up from the bottom of the pole, all straight, and then use a small hook (piece of .010” brass wire in a wooden dowel) to grab and pull them out at the signal locations (side holes) as I push up the bundle. A separate thread on JMRI signal programming would be great. It still feels clunky to me, and that’s just lack of full knowledge of the system and always wondering if there is a simpler way to do something. I always feel like I’m using brute force through programming. @Wutter, I'm definitely going to use your printed frames for mounting. I just need to install more flexible leads so they don't put any force on the signal base from below. Thanks for the link to the cables you use. I'm also tempted to stick with RJ connectors ala @peteski's suggestions due to their simplicity (and the fact that I have enough on hand to finish the job). This shot does remind me of one proto question I still have: for SP signals, should the lower head be on a longer arm (farther from the mast) than the upper head? The best answer I could find from a quick web search is "yes" based on this page, however I have nagging doubts due to shots like this signal in Mojave. ... This shot does remind me of one proto question I still have: for SP signals, should the lower head be on a longer arm (farther from the mast) than the upper head? The best answer I could find from a quick web search is "yes" based on this page, however I have nagging doubts due to shots like this signal in Mojave. The answer is "yes". To both styles. If offset from the mast, they will be on the same plane, if centered on the mast, the bottom head will be on a longer bracket. I wasn't aware of a particular rhyme or reason for using each style, other than the centered style was the choice in tight clearances, like between two tracks. Nothing here is glued down yet because I might want to make some changes to the plan after the first few sessions. The industries here are all food-related, so the traffic is mostly reefers, covered hoppers and food-grade tankers, but I'm thinking of adding a scrap yard in the far corner for a bit more variety. 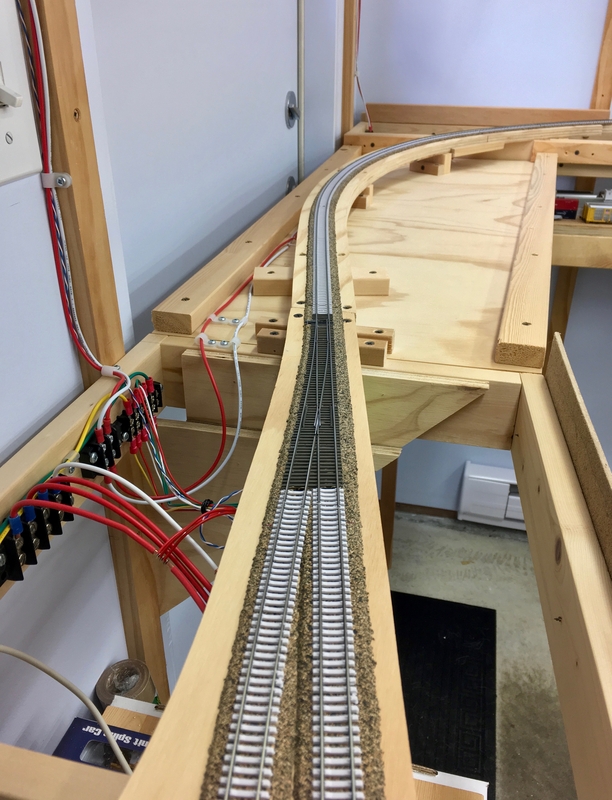 Once I'm happy with the operations, I'll finish it off with code 40 track and hand-laid turnouts. This will very much be a foreground scene, so it warrants a hand-laid #10. 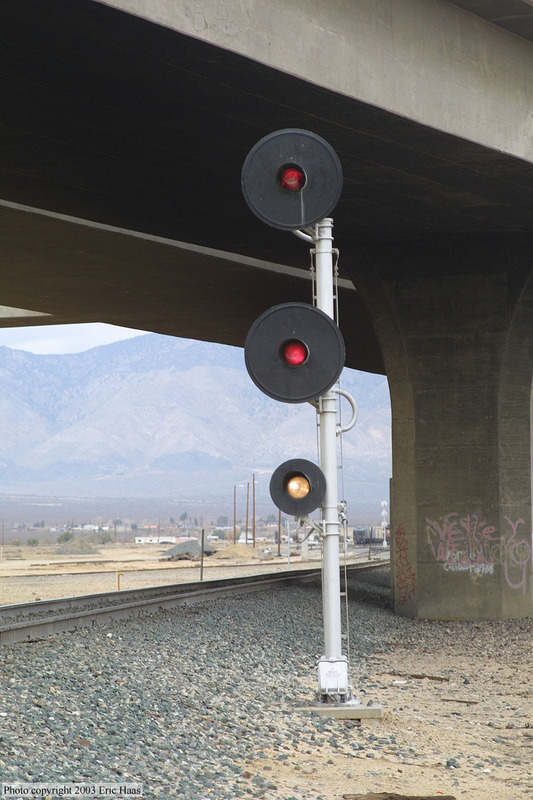 The remaining two CP's to be completed are the Edison crossover (waiting to make sure it's well positioned for the Edison local job) and Kern Junction, which has 8 turnouts, including 3 crossovers. Both CP's are currently still using hand-thrown temporary turnouts. The remaining time between now and the meet on May 3 will be devoted to cosmetic improvements. Photos as progress warrants. You say un-photogenic but I see wood working art in each of those images.